In 2016 Rhod took the reins of BBC2's hugely popular show You're Fired; hosting the latest series of The Apprentice spin-off show interviewing the outgoing candidates and taking a light-hearted look at events in the main show. In 2014 he joined BBC2's Never Mind the Buzzcocks hosting a series of the iconic pop quiz alongside long-standing team captains Noel Fielding and Phill Jupitus. Other recent TV appearances include a seventh series of Rhod Gilbert's Work Experience, hosting Live at the Apollo (Rhod's third appearance on the show), and a sensational performance on a Christmas Day special edition of Michael McIntyre's Comedy Roadshow. In 2012, he was invited to perform for the second time on The Royal Variety Performance; joining an illustrious line-up for the centenary event held before Her Majesty The Queen. He has also hosted Have I Got News for You? and has made regular guest appearances on panel shows Qi, Would I Lie To You? and 8 Out of 10 Cats Does Countdown. Rhod has written, and starred in seven series of his hugely popular programme Rhod Gilbert's Work Experience which airs on BBC One in Wales, and BBC2 across the network. Rhod is an Associate Producer on the programme, and involved in all aspects of the production both on and off screen. Series one was awarded a Welsh Bafta in 2011, scooping 'Best Factual Series'. Series five scooped three nominations at the 2015 Bafta Cymru Awards; Rhod won ‘Best Presenter’ for the RAF Fighter Pilot episode, and the series also earned nominations in the ‘Best Factual Series’, and ‘Best Photography’ categories. Throughout the series Rhod has tried his hand at all manner of ‘proper' jobs from being a Binman in South Wales to Butler to a Lord, and in his most difficult challenge to date; an RAF Fighter Pilot. Series one and two are now available to own on DVD. Rhod has also recently produced Rhod Gilbert vs Kilimanjaro, which followed him on his toughest challenge yet; leading a trek to Africa's highest peak in aid of Velindre Cancer Centre. He took no camera crew, and never had any intention of broadcasting the footage, but as a special one-off feature in 2015, BBC Wales showed the footage captured by Rhod and his companions during their trek of a lifetime. An established household name, Rhod has also hosted two successful series of his own show for BBC1. With the help of special guests and regulars Greg Davies and Lloyd Langford, Ask Rhod Gilbert set out to answer all manner of burning questions from the sublime to the ridiculous. The show ran for two series and was a huge ratings success, averaging in excess of two million viewers each week. Rhod later teamed up with his partner in crime Greg Davies to star in World's Most Dangerous Roads, embarking on a treacherous (and frequently hilarious) adventure through Nepal for BBC 2. A natural and accomplished presenter, Rhod has hosted his own weekly Saturday morning show for BBC Radio Wales since 2007. The show blends music, comedy and idle banter, and is renowned for its irreverent and ill- informed opinion. He has also stepped in to host BBC Radio 2's flagship show Steve Wright in The Afternoon, and has regularly held the reins for both Graham Norton and Dermot O'Leary on the station. He has also hosted a one-off special for Radio 2: Rhod Gilbert's New Year's Resolutions which went out live on New Year's Day. Also on Radio 2, Rhod has written and recorded his own series; Rhod Gilbert's Bulging Barrel of Laughs. The show featured regular guests, stand-up comedians and live music from hit bands and was nominated for a prestigious Sony Radio Academy Award in 2011. 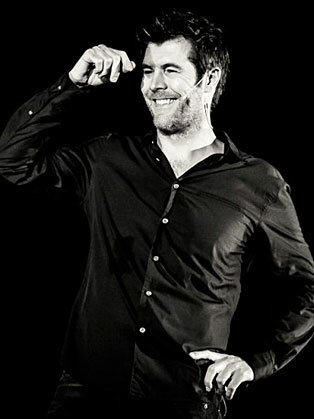 Rhod's stand-up world was also depicted in a one-off sitcom for Radio 2; Rhod Gilbert's Leaving Llanbobl. Rhod is now busy developing a TV sitcom based in the same fictional Welsh village of Llanbobl.